Be the first to share your favorite memory, photo or story of Brandi. This memorial page is dedicated for family, friends and future generations to celebrate the life of their loved one. 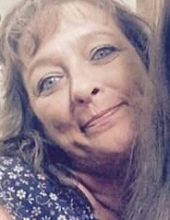 Brandi K. Bennett, 46, of Stonefort, passed away, September 13, 2018 in Eldorado. Brandi was born in Eldorado on November 17, 1971 to Alan and Debbie (Cook) Bennett and they survive in Stonefort. Brandi was a free spirit and loved everyone and she will deeply missed. Surviving are her children, three sons: Nathan Reeder and Brayden Williams of Stonefort and Austin Conley of Harrisburg and two daughters: Kristin Wallace of Evansville, IN and Courtney Conley of Harrisburg. Seven grandchildren: Blayne Rasmussen, Trenton Rasmussen, Emma Rasmussen, Adrianna Rogers, Ayden Rogers, Kinzlee Reeder and Carson Conley. She is also survived by an Aunt Janie Cook of Eldorado. To send flowers or a remembrance gift to the family of Brandi K. Bennett, please visit our Tribute Store. "Email Address" would like to share the life celebration of Brandi K. Bennett. Click on the "link" to go to share a favorite memory or leave a condolence message for the family.